We love telling the story of ‘God with us’ in as many ways as possible and to as many people as possible. 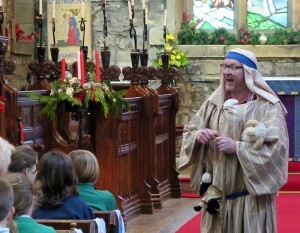 In Wednesday 230 children and staff from 5 Ilkley schools visited All Saints for Rewind to Christmas. Exploring why Christmas is such an important time around the world for Christians. Fast moving and fun the children heard how the message of the birth of Christ came first to ordinary people doing an ordinary job, shepherds. The children left with a challenge to find time over the busy festive period to pause, light their candle and remember the true reason for the season.